For more Spiritual Thursday posts, click over to Donna’s blog, Mainly Write. The moon and the stars to rule by night: for his mercy endures forever. I went out on a walk Wednesday morning in search of the moon. 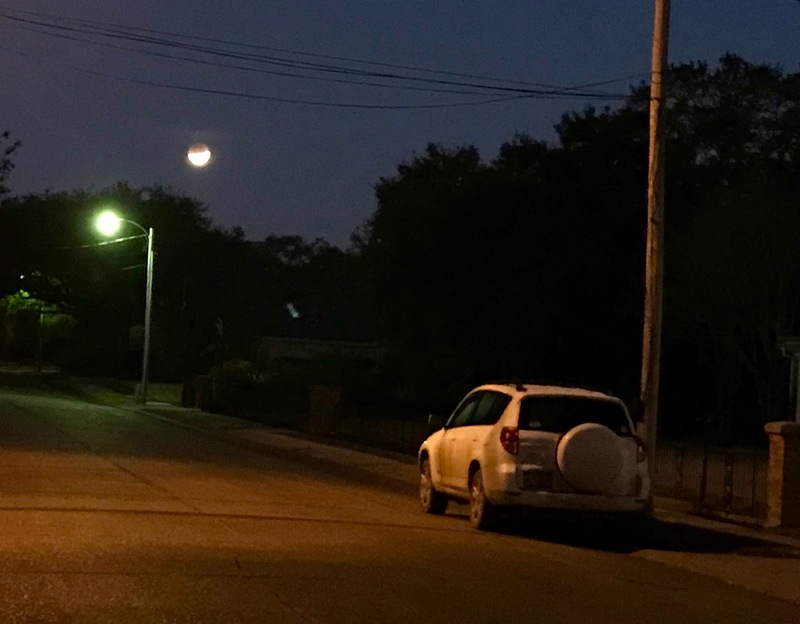 I chased it through the neighborhood trying to capture the eclipse on my phone. The pictures, of course, do not do it justice. Eclipsed moon hides in the trees. I thought about how this phenomenon fascinates us as Earthlings. We travel through each day without realizing that the planet is moving and turning and changing, constantly. We are reminded of our minuteness when a super moon appears in the sky, when that moon is eclipsed by the place we walk upon. But smallness means nothing to God. God cares for every particle, every sparrow, every hair upon your head. Like an eclipse, this goodness and love is hard to imagine, difficult to believe. So we keep testing it. Who am I to eat the crumbs under your table, Lord? Help, Thanks, Wow is the title of a book by Anne Lamott. 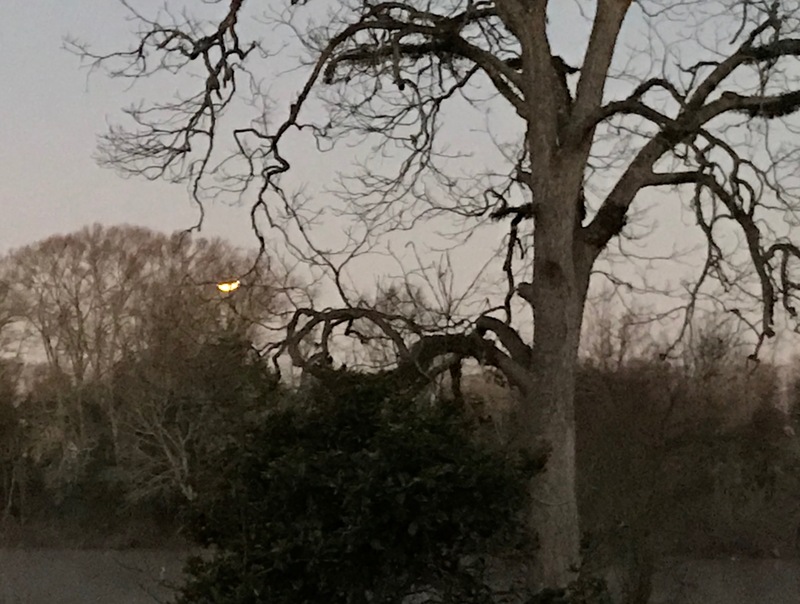 Hello Margaret- Looking- for- Louisiana-Moon! I love the verse you selected & all the moon images in words & art. That eclipse reminds me of the kite eaten by the tree in a Charles Schultz Peanuts cartoon panel! It’s precious. And thanks for reminding me about Michele Kogan’s lovely painting. I saw it flash by on a Facebook feed & want to go back to it, at her site. This post resonates with words I needed to hear. ❤️ your words with Michelle’s art. I would love this as a card or small print. Lucky you to see the eclipse. It was well down below my horizon when it started. I saw it just before it started. I used a part of the scripture in my found poem today. Love all your reminders of the constant love and attention we receive from God. Your poem circling the moon is a great reminder and beautifully written. Wow, you did really well capturing the eclipsing moon! Moon photos are difficult to capture at the best of times. 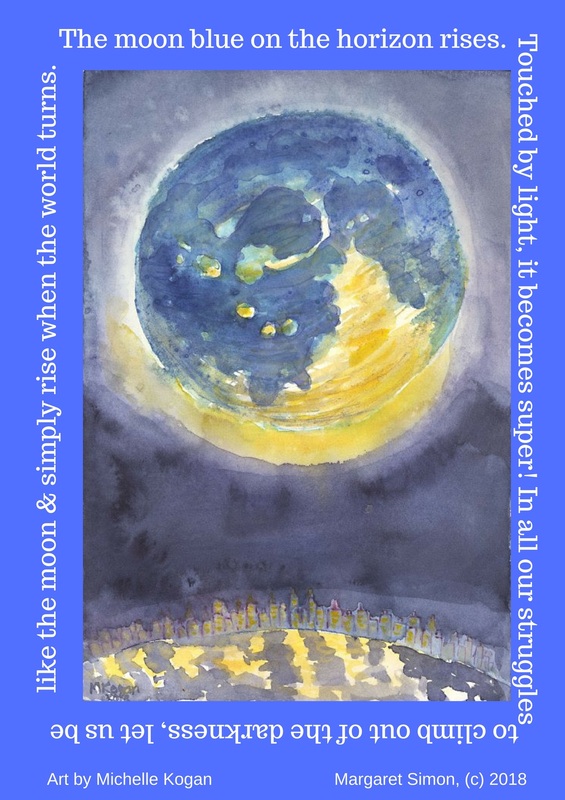 And I love your moon poem paired with Michelle’s art. So lovely! Thanks for this rich post Margaret–loved seeing pics of the moon you captured. “& simply rise when the world turns” so much meaning in these few words, beautiful poem. Your poem and my art I think were serendipitously meant to go together.